RED ARMY: The Cold War is long gone but the weapons of the former Soviet Union live on. Experience some of the most awesome small-arms from the former Soviet Union and see if your group has got what it takes to be Red Army troopers. We’ve all seen the old war films but what does it really feel like to let rip with an AK47, or to squeeze the trigger on a military sniper rifle powerful enough to penetrate brick walls at half a mile! On top of all this we’ve also included some shooting with the Makarov pistol, and the Saiga 12K rapid fire combat shotgun as used by the elite Russian Spetsnaz (special forces). Get extra range time if you rent additional guns from the shooting range’s wide selection of firearms or buy more ammo. Our driver comes to your hotel entrance and collects your group at the agreed pick-up time. With some hotels or apartments it is difficult for the driver to park or leave the minibus so please keep an eye on the entrance to the hotel, and have your group ready to go a few minutes before the agreed pick-up time. If your hotel or rental apartment address is changed at short notice please let us know the new address as soon as possible, so we can brief the driver with the correct address and avoid any lengthy delays finding you. The trip to the range usually only takes about 45 minutes. After being welcomed to the shooting range, and sorting out any balance payment with the Range Manager (for those paying the balance on arrival – see prices pages for details) there is a short safety briefing in English from the senior instructor on site, and the chance to ask any questions. There is also a waiver form to read and sign. This all takes about about 10 minutes, and then the real fun can begin. 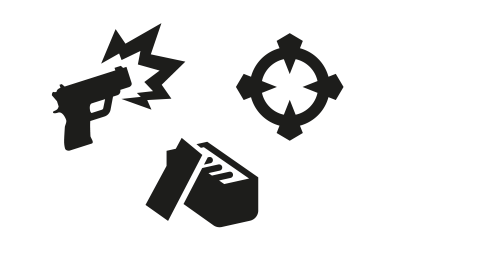 You each take turns at shooting the different guns that are included in your chosen shooting event. Those not shooting can watch the shooters whilst they are waiting for their turn to shoot. The range is outdoors and depending on how big your group is we will have between 1 and 6 people shooting at any one time. 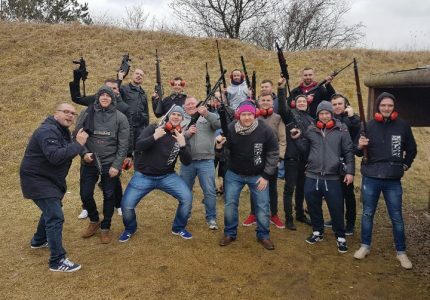 Most of the individual firing points are close to each other, so you will be able to watch those shooting and are welcome to take photos of your friends whilst you are waiting for your turn. If the weather turns nasty at any point the firing points are all covered, and there is a sheltered waiting area right next to them to keep you dry whilst waiting. In summer drinking water is always available at no extra charge, and in winter there are complimentary tea/coffee making facilities. There is 1-to-1 instructor coaching during all periods of live fire to ensure your safety. Towards the end of the event each shooter gets his/her own Gun Gremlin T-shirt to shoot some souvenir bullet holes in to remind them of the trip to Top Gun Prague. 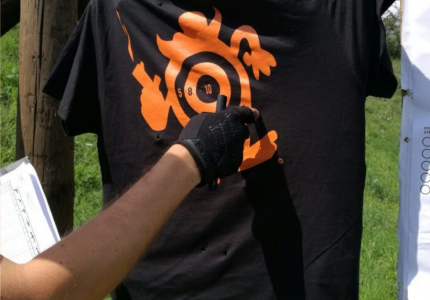 The Gun Gremlin T-shirt is usually shot with a full bore pistol (all of our shooting events include at least one pistol) because these tend to make the most impressive bullet holes! For more info and to view photos of the T-shirt shoot Click Here. The winners are announced along with a score sheet so that everyone can see how they did and the winners gets awarded a certificate. And finally there is an opportunity for some group photos holding some of the unloaded guns. There are a couple of safety rules that must be observed when posing with the guns (i.e. Finger off the trigger; Gun always pointed in a safe direction, never at another person). 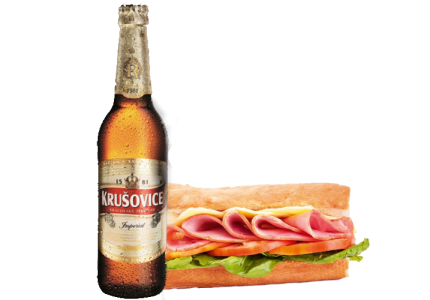 There is then time for a complimentary beer and sandwich before taking the minibus back to your hotel or apartment in Prague. If you are in a rush to get back you are welcome to take your beer and sandwich on the bus with you, but most people choose to chill out at the range either inside or outside the log cabin clubhouse. If anyone in your group requires a vegetarian sandwich please let us know at least a couple of days before shooting so we can order this for them. Then its back to Prague on the minibus. As with the trip out, this usually only takes about 45 minutes.  If you only have hand luggage it is also possible to drop you off at the airport after shooting instead of going back to central Prague, but you will need to tell us at the time of booking if you want an airport drop-off. There is an extra charge for airport drop-offs because of the longer journey and airport parking. This airport drop-off fee is £5 per person for groups of 4 or more people (for smaller groups of 2 or 3 persons it is £20 for the group) and is payable in advance at the time of booking. Let your friends and others know how amazing your experience was by sending in a Tripadvisor review and sharing your experiences on social media. Also we’d love to hear how you got on at the range and for any feedback so that we can make the shooting experiences get even better. Payable when you book. This deposit forms part of the total price so it's not refundable after shooting. Red Army is only for groups of 2+. Pre-booking essential (£20 or €25 per person spectator fee to cover transport, refreshments etc). This event is not suitable for larger numbers of spectators. If more than 2 people in your group do not want to shoot then it may be better for them to plan some different activity for a few hours and then meet up with the shooters later. Expert 1-to-1 instruction for maximum safety. 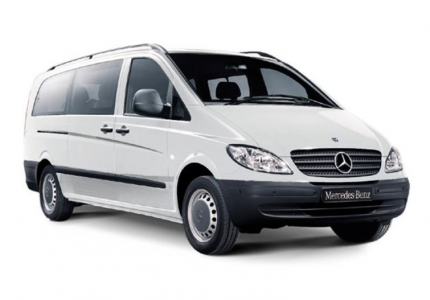 Hotel transfers (modern comfortable car or minibus). Extra range time (if you want to buy more ammo or rent additional guns). Beer and sandwich each (after shooting). GUNS AND BOOZE DO NOT MIX! For everyone’s safety any member of your party suspected to be under the influence of alcohol will not be allowed to participate in the shooting event. We can accommodate up to 2 spectators per group – pre-booking essential (£20 or €25 per person spectator fee to cover transport, refreshments etc). This event is not suitable for larger numbers of spectators. If more than 2 people in your group do not want to shoot then it may be better for them to plan some different activity for a few hours and then meet up with the shooters later. 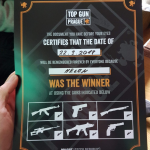 Our shooting events are organised as group competitions so that you can all compare your individual scores at the end, and so that we can award the competition winner with a certificate for achieving the highest score. Unfortunately this means that it is not really practical to mix up the packages within a group. It would also mean splitting your group up to different parts of the range and more individual waiting time so would not be as much fun. It works out much better to choose one shooting event that everyone can afford (like our 4 Guns Contest, or the Big Five), and then those with more interest can shoot some extra guns at the end including guns like the Desert Eagle and .44 Magnum. This way you will get a group shooting contest, plus the flexibility for individuals to try different guns at the end. Please advise your group to dress for an outdoor event according to the time of year – e.g.shower proof jacket April-Sept, and a warmer coat Oct-March). For spring and summer time, especially at weekends, it is best to book at least several weeks in advance to avoid disappointment. ZERO KNOWLEDGE OR SKILLS WITH FIREARMS? For safety reasons all of our shooting events assume zero knowledge or skills with firearms. 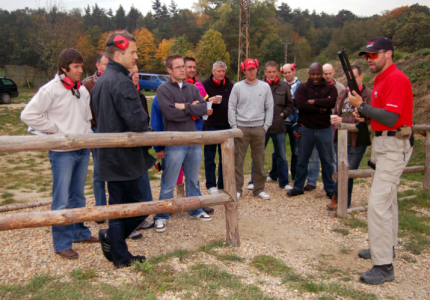 Our events are designed to give non-shooting customers a really positive introduction to target shooting. Minimum age for booking the event is 18, but the minimum age for shooting is 13 years old provided the young person is accompanied by a parent or other responsible adult. Maximum ratio is two under-18s per per parent/responsible adult. 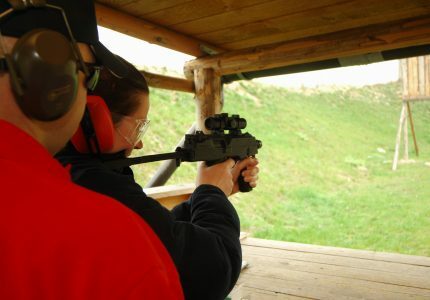 Ear and eye protection is provided at no extra cost at the range and is compulsory when shooting, or in the immediate area that shooting is taking place.